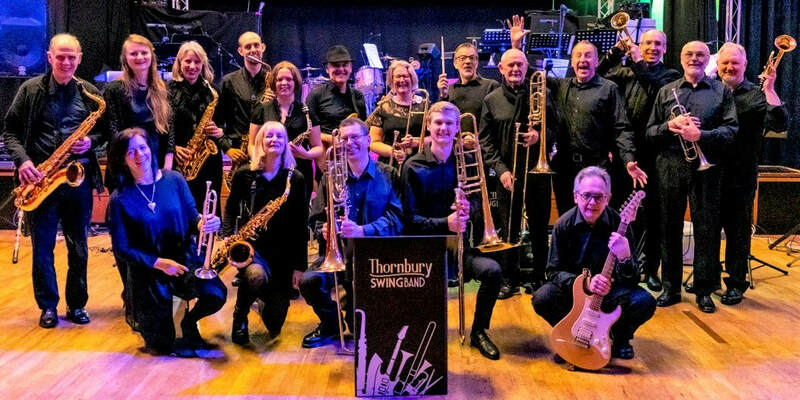 Thornbury Swing Band plays swing jazz instrumental and vocal numbers from the 1930s right up to modern times - with a line up of saxophones, trombones, trumpets, and male and female vocalists. All supported by a rhythm section of bass, guitar, keyboard and drums. Our aim is to have a good time playing great music and, in doing so, entertain and delight our audiences. We are (of course!) available for booking. We perform at several events throughout the year including concerts, weddings and parties. ​We give our time and enthusiasm to raise money for charity. After covering our running costs (insurance, music, etc), all money raised by the band is donated to good causes in the local area. Since 2008 we have donated several thousand pounds to Brain Tumour Support, a Thornbury-based charity which provides specialist, tailored services for any one affected by any type of brain tumour. We have also supported Bristol Children’s Hospital, the Lydia Biddlecombe Star Tribute Fund, Holly Hedge Animal Sanctuary and other local good causes. If you would be interested in the band supporting your charity, please get in touch via our contact page. "A huge thank you to you all. We loved the atmosphere you helped to create and there has been such positive feedback on the fabulous music you made, Thank you." ​"Just wanted to say a HUGE THANK YOU once again for coming to play at our event on VE Day in Long Ashton. You went down a storm. EVERYONE loved you and thought you were fantastic. Am so happy that I know about you and can call you up for playing at our events." "Brilliant entertainment. Thank you all." "I second that, truly a fantastic evening"
"I am sure you are all still shattered from last night. You all worked so hard to make the evening go with a "Swing'. Please can you personally thank all of your band for me, for providing everyone with a truly memorable evening."